PLATELET RICH PLASMA (PRP) is a procedure that involves withdrawing a patient’s blood, processing it to isolate the platelet-rich plasma (PRP), then re-injecting it to erase wrinkles and create a more youthful look. Used by celebrities such as Kim Kardashian, the skin tightens, and glows with color, and scaring softens for a beautiful younger and very natural result. First, the medical professional draws about 50cc’s of blood. 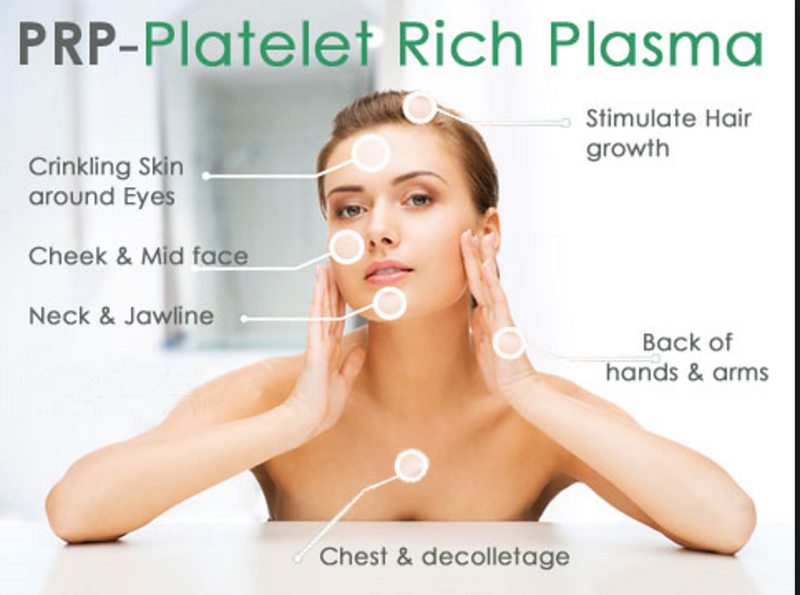 Then, using the latest Tru PRP® technology to isolate platelets from that blood (platelet-rich plasma or PRP)–all within about 30 minutes in the office. Then she “activates” those platelets to cause the release from the platelets of at least 8 growth factors that would normally be used to heal injured tissue. These growth factors work like magic to cause increased collagen & new blood flow. To rejuvenate new skin, these growth factors must be put back into your face. The whole in-office procedure takes about 60 minutes with minimal discomfort and downtime. Using numbing cream and a very small needle (for almost no pain), the medical professional injects the patient’s own growth factors back into the face in a particular way. These growth factors then activate multi-potent stem cells already in the skin (tricking them into “thinking” there’s been an injury and new younger tissue should generated). The multi-potent stem cells then develop into new collagen, new blood vessels, and new fatty tissue trying to “repair” the skin that was never injured! The result…younger-appearing skin! The effects of the procedure improve for 2 to 3 months and last for at least 1 to 2 years! by Bruce Freund, M.D., F.A.A.D.